Hiding in My Craft Room: Day 8 of 12 Giveaways! ScrapbookPal.com is so awesome! Not only a great place to shop but also a great sponsor! I ordered some Sketch Copics but I accidentally ordered the Ciao. 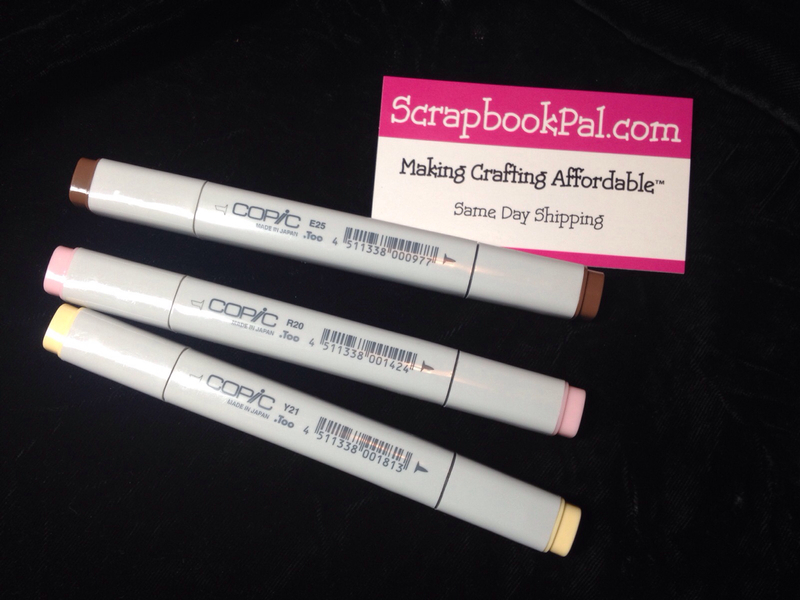 Scrapbookpal.com not only sent me the markers that I meant to order but said I could give these away on Hiding in My Craft Room! Yeah ScrapbookPal.com! We love you!! Be sure and check out their store! Only $25 gets you FREE shipping! Tell them Laurie from HIMCR sent ya! R20 Blush - great for cheeks! To get entered into this giveaway all you have to do is leave one comment on this post! Today let's share a blast from our past! I have a funny thing to share! When I was a little girl I didn't like to color at all or have the patience for it! I color WAY more as an adult as I as a child! I find it therapeutic! I wish I had known that years ago! I love le coloring as a child. It was fun and I still love to color. I just don't have as much time to do it. I used to have fun colouring my son's colouring books when he was little (probably more than he did : ) Now I am getting into the adult colouring book craze and loving it. I think I was much more into coloring (just for fun at that age) that I am now. Well, of course now I like doing it but it is always just focusing coloring it for a card that I am making at that point. I should just grab my markers and a bunch of images and color them all - then I'd have ready images for cards in hand. How awesome is this? When I was a little girl, I was a tomboy---big time! So much so, one time, I got stuck in a huge garbage container, like the one they use for renovations? Yeah, got stuck, couldn't get out because I was scared. Oh boy--the headaches I must have caused my mother! A Blast from the past - When younger I liked to color. Now, craft coloring is so much harder than when younger. I just heard that David Bowie died after an 18 mth battle w/ cancer at age 69. He had celebrated his 69th bday on Fri 1/8 and his new CD Blackstar was released which I bought Sat. Hubby & I watched a DB concert from 1999 on Paladium channel Fri evng. RIP David Bowie. Two of my best friends have gotten into coloring and also stamping. I guess I need to follow. As a child I was an avid reader. So much so that you could find me walking around the neighborhood, book in hand. I still live in that same neighborhood but now it's more developed, the roads are paved and there's no way I could that now. But I still love to read! When I was a little girl I used to watch my sister (10 years my senior) draw faces. That is all I ever saw her draw. She was very good at doing eyes and pretty good at mouths, but she always had trouble with noses and would basically skip doing ears by having long hair that covered them. I guess I am a visual learner because for all I ever drew for most of my life were faces, particularly eyes which were easy for me. Mouths were a little more challenging, but not much. I struggled to get noses right and I too opted for long hair for many years, before I starting from scratch by studying ears. Thanks for this cool giveaway and for telling us about Scrapbook Pal. I have purchased some copic markers last year. Just a few but I have not used them yet. I am not sure how to start learning. I have watched videos but I guess I need something to practice on because I am afraid to try on a project I really need. How did any of you start and how long do they last. I think that is part of the fear that I will use them up learning and they are pricey. As a child my sister (10 years older) taught me how to crochet and I don't remember making very much stuff but it was the foundation for all my crafting that I do today. I do crochet still and I used to work for a cross stitch artist when I was home with my kids. She would provide the kit and I would stitch it to send to a shop to display. I found paper crafting in 2007 and was hooked. Thanks for the information about Scrapbook Pal. I will definitely be checking them out! Happy Monday. When I was a little girl I would always wanted t bake but my 1st batch of cookies which were oatmeal cookies were a disaster. I would read the recipe and if I did not know what it was (keep in mind I was just learning and so young) I would substitute it with what I thought it was...LOL..my mom would laugh with me at the end and we would make a whole new batch the right way...I still love to bake and cook. When I was a child, I loved coloring and I mastered staying in the lines at an early age. As an adult, I struggle with coloring, I wish I had more time to practice! Yes, what Treva said! I was an avid colourer as a child but not that great as an adult. I don't have any Copics so I would LOVE to try these - thank you! As a child I loved all things crafty, but I was not athletic. Being one of eleven children, I did not learn to ride a bike til I was 13. I finally taught myself and love to take bike rides with my family. Thanks foe the chance to win! Thanks for the chance to win these Copics. I only started coloring as an adult - love copics - would love a chance to win!!! I had a friend from elementary school tell me that she was jealous of my coloring because it was always so neat and in the lines. I thought that was funny because I would have never thought that she would feel that way. I colored as a child, I colored examples when I was both a pre-school teacher for 17 years and as an instructional assistant in public kindergarten. Now I get to color my projects. I don't think I will ever not color things. lol. Thanks for sharing. So fun! I was very serious as a child and would get mad when my friends wanted to play and I wanted to discuss the world's problems! Thank you for passing on the Copic's. That's very generous. Thank you for the challenge, also. We melted crayons which I thought was so cool. Sometimes we would sharpen them and iron them in wax paper. I did all sorts of crafts since a young age, but when it came to painting, it was always messy. I wounder if I could do a neat job now...yet to try. I loved to color as a kid...and make my own pictures to color! I would draw lines all over, never lifting my pencils and color in the shapes. Very abstract. I also loved to read which I still love today! When I was a girl one of my favorite things to do was make paperdolls and their wardrobes. I would cut out every outfit, color them in and dress them all day long. I still love to color and fussy cut! I also loved to play school....and of course I was always the teacher. I've always been around craftiness but not really the kitchen. It was no surprise when I made my first cake that salt was the main ingredient.....family gatherings still include cake jokes....as long as I didn't make it they would try it :) Now, my hubby just says "Great! More for me!" Wow, that is one amazing prize. Thank you for the chance! It's very nice of ScrapbookPal.com to sponsor this giveaway. I was always good at coloring as a child. I know how beautiful images can turn out...and I do it, but most of the time I just don't have the patience for coloring. funny story...there was a rabbi and a priest...lol! Wow-so generous from both you and Scrapbookpal! By the way, I always liked to color when I was little. My sister, who was 5 years older than me also loved to color with me, even when she was a teenager and I was the pesky little sis! She turned out to be a teacher and has taught pre school, Kindergarten, 1st and 2nd grade, so she still gets to color! The one thing that has followed me from childhood was the fact that I always had a spoon and the peanut butter and I was given the nickname of Peanut Butter which a few people still call me to this day.